Cassoulet is a traditional, thick bean and meat stew from the Southwest of France, where it takes on almost religious importance. Every town has a variation on the recipe, and each believes their interpretation is the only true cassoulet. We offer an easy-to-follow recipe kit that will make you an expert in no time (and a believer in the superiority of our version). If it's your first time making cassoulet, be sure to check the cooking tips before you begin. Cassoulet makes a hearty meal that is perfect for sharing with friends along with a bottle (or two) of robust red wine. 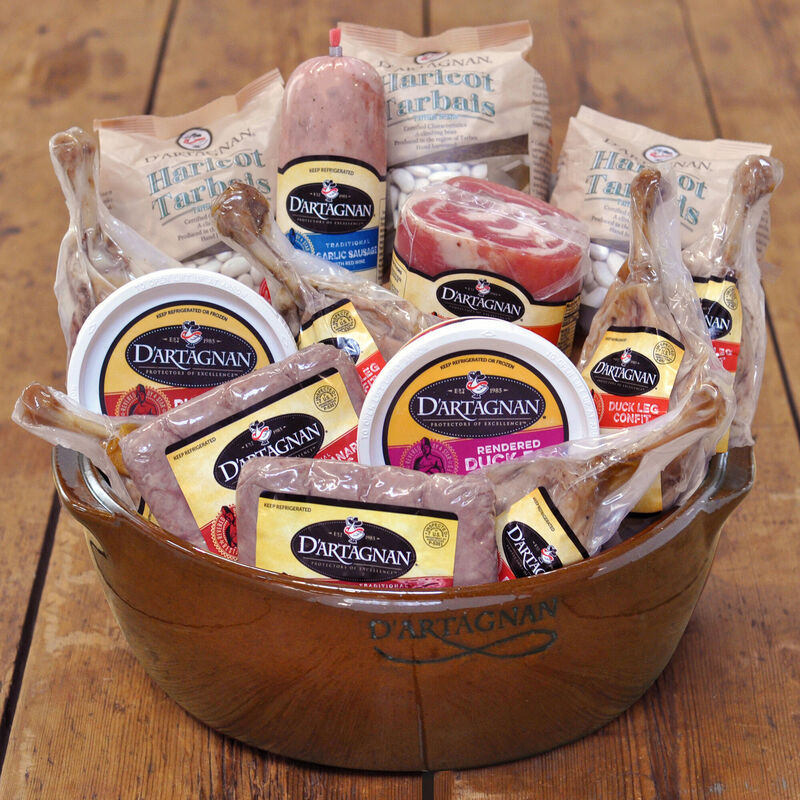 With or without the clay bowl, our cassoulet kit makes a marvelous gift for those who love to cook. In fact, it is mentioned as such in the Bloomberg BusinessWeek holiday gift guide for 2015. Note: Please see individual product pages for nutritional, allergen information and expiration dates. Cassoulet kit is available with the clay bowl in limited quantities. Please be sure to click the correct button to order either: the cassoulet recipe kit ingredients, just the bowl, or both the ingredients and the bowl in the specially-priced package. In the event that any of the kit's products listed above is not available at the time of shipment, D’Artagnan reserves the right to make an appropriate substitution for an item of similar value. Cooking Tips: While our recipe recommends cutting each duck leg confit in half at the joint, you can also shred the duck meat off the bones if you prefer. This can be helpful if you’re serving a very large crowd. Additional meats, like sausage or our chicken confit can be added. Don’t hesitate to cut open the crust to check if the casserole is drying out too much inside. The texture should be that of a thick stew. If the texture seems too dry or pasty, add some liquid, such as stock or demi-glace. Cassoulet is quite filling, so is often served with a refreshing salad, a slice of rustic bread to mop out the bowl, and a hearty red wine like Madiran or Malbec.